This community of practice is for everyone working in the area of information and communications technologies for agriculture (ICT4Ag) in developing countries. Digital native or not, the CoP connects GIZ colleagues knowledgeable and experienced in the ICT4Ag field, looking for more expertise and best practices. ICTs are devices, infrastructure and programs for digital processing, storing and transferring of information. It includes computers, the internet, emails, mobile phones, radio, weather stations as well as technology for transmitting data through copper wires, fibre-optic cables, GIS or via radio signals. The use of ICTs for agriculture is a crosscutting topic, comprising a wide range of agricultural solutions to challenges such as the access to information and training via formal and informal education for farmers in rural areas. Why do we need another CoP? 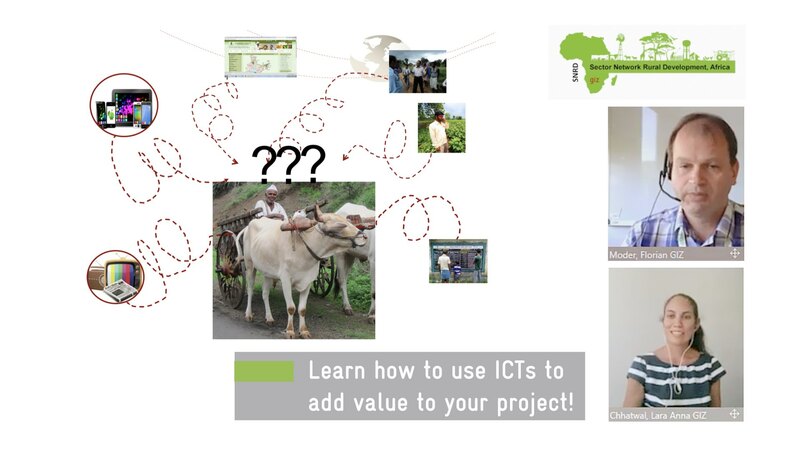 A great number of ICT4Ag solutions are already implemented in GIZ agriculture projects. At the same time, challenges such as the setting-up of long term business models or the protection of farmer-related data are not sufficiently addressed in GIZ yet. To not fall behind and to increase the effort to promote and upscale ICT4Ag solutions, exchange of knowledge and experiences inside and outside GIZ are crucial. The CoP provides a platform for information exchange on the development and implementation of ICT tools, approaches and best practice examples. It enables the sharing of content, discussion and further development of ICT practices within GIZ. The CoP is forum for those dealing with ICTs in GIZ agriculture-related topics in developing countries, or those planning to do so. It supports the continuous development and adjustment of tools, approaches and examples of best practices, and provides a stage where they can be presented, discussed and developed further. Founded at the 2017 SNRD conference in Pretoria, themes discussed to date include the framework conditions to implement digital and non-digital ICT4Ag solutions, aspects of private sector inclusion and sustainable business models, tailoring ICT4Ag in order to promote youth and woman empowerment, M&E tools to assess the success of ICT4Ag, and many more. As a crosscutting issue, the use of ICTs can contribute to all of the 17 Sustainable Development Goals. ICTs are specifically mentioned in SDG4 (Ensure inclusive and equitable quality education and promote lifelong learning opportunities), SDG5 (Achieve gender equality and empower all woman and girls), SDG9 (Build resilient infrastructure, promote inclusive and sustainable industrialization and foster innovation) and in SDG17 (Strengthen the means of implementation and revitalize the global partnership for sustainable development). In addition, ICT4Ag contributes to SGD1 (End poverty in all its forms everywhere) and SDG2 (End hunger, achieve food security and improved nutrition and promote sustainable agriculture). The CoP ICT4Ag meets virtually throughout the year, using webinars to enable the exchange of knowledge with GIZ internally but also connects with external ICT4Ag experts. Many farmers have very limited access to information, causing poor farming practice and low productivity in sub-Saharan Africa. This rice and cocoa value chain example demonstrates how mobile based ICT solutions can contribute to closing the knowledge gap. At the SNRD Africa conference in Pretoria, the CoP ICT4Ag was launched into life. It is open to anyone working in the area of information and communications technologies for agriculture in developing countries. Members of the two SNRDs share their experiences with ICT4Ag — from Africa to Asia and vice versa! Conventional, freely available satellite earth observation data can be utilized to assess the state and changes in agricultural systems — see how your project can do it! How to Use Open Data for More Impact of Agriculture and Nutrition Related Projects — Webinar Recording!